Before reaching the catharsis in the “More LINQ with System.Interactive” series over here, I wanted to ensure a solid understanding of the essence of LINQ in my reader base. Often people forget the true essence of a technology due to the large number of auxiliary frameworks and extensions that are being provided. Or worse, sometimes a sense for the essence never materialized. Searching for essence is nothing other than a “group by” operation, partitioning the world in fundamentals and derived portions. One succeeds in this mission if the former group is much smaller than the latter. 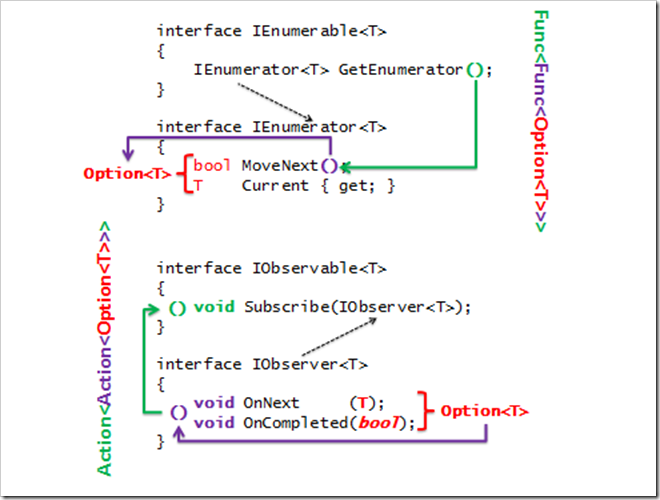 In this post, we’ll try to reach that point for the IEnumerable<T> and IObservable<T> LINQ implementations, illustrating both are fundamentally similar (and dare I say, dual?). 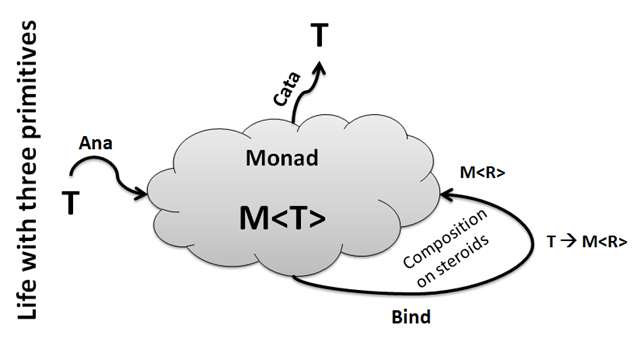 You can already guess much of the essence lies in the concept of monads. By the end of the post, we’ll have distilled the core of LINQ, which I refer to as MinLINQ since small is beautiful. // Code - friendly "interface"
Why do we care? Well, it turns out that IEnumerable<T> and IObservable<T> tend to obscure the true meaning of the objects a bit by having many different methods to facilitate the task of enumeration and observation, respectively. The source of this apparent bloating is irrelevant (and in fact follows design guidelines of an object-oriented inspired framework); what matters more is to see how the two mentioned interfaces can be boiled down to their essence. 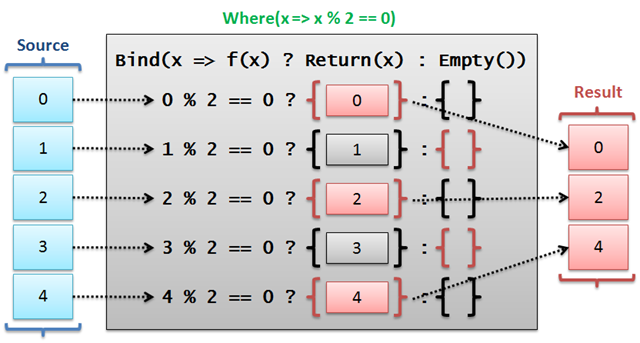 Here the arrow indicates “goes to”, just as in lambda expressions, with the argument on the left and the return type on the right. All that has happened is reverting the arrows to go from an observer to an enumerator and vice versa. That’s the essence of dualization. To continue on our merry way towards the essence of LINQ, we’ll be providing five essential operators as the building blocks to construct most other operators out of. Needless to say so, those operators will use the above flat function “interfaces” to do their work on. Let’s start with a couple of easy ones: Empty and Return. What used to be output now becomes input: the None constructor call no long appears in an output position but has moved to an input position. Similar for the observer, indicated with o, which has moved to an input position. Upon giving the observable object (the whole thing) an observer (o), the latter gets simply called with a None object indicating the end of the sequence. 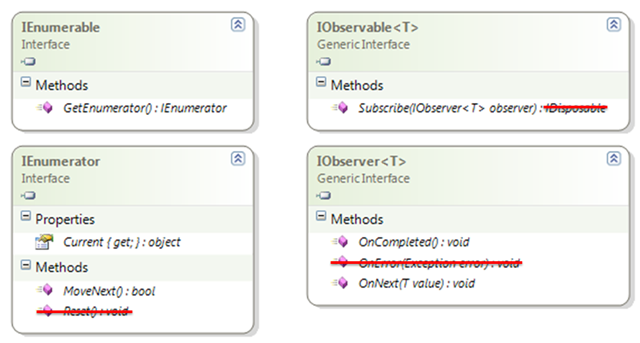 The inner call is equivalent to OnCompleted, while the whole lambda expression is equivalent to Subscribe. The above will print Some(1) and None() twice, since both observers are getting it (in invocation order, coinciding with lexical order). The state local to the “enumerator block” contains a counter that keeps track of the number of MoveNext calls that have been made. The first time, we return a Some(value) object, and the second (and subsequent) time(s) we answer with None. Notice this has the implicit contract of considering a None value as a terminal in the grammar. If you want to enforce this policy, an exception could be raised if i reaches 2. Here, upon subscribing to an observable using observer “o”, the operator itself subscribes to the source observable that was fed in to the function. It does so by providing an observer that takes in the received element as “x”. Inside the observer’s body, which gets called for every element raised by the source, “x” is analyzed to see whether or not the source has terminated. If not, Bind does its combining work by calling the selector function for the received element, getting back a new observable source “f(x.Value)”. 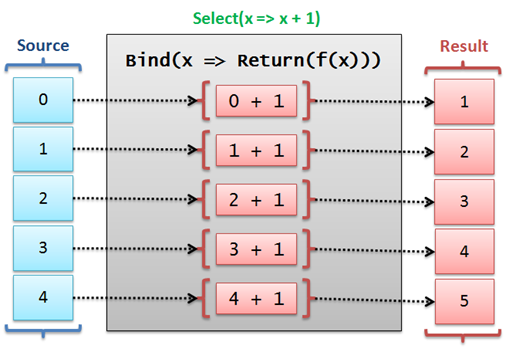 The goal of Bind is to surface the values raised on this source to the surface of the operator call. Hence, we subscribe to this computed source “f(x.Value)” by providing an observer that takes in the received value as “y” and raises that to the surface by calling “o” (the external observer). Again we assume None is terminating the sequence, which could be enforced by keeping a bit of state (left as an exercise). We’ll see examples of operator usage later on. In the FEnumerable case, things get more complex as we need to keep track of where we are in the source and projected sequences across different calls to “MoveNext”. While we could realize this using a state machine (just like iterators would do), I’ve taken on the challenge to write a state-keeping set of loops by hand. It may well be optimized or tweaked but it seems to do its job. Important situations to keep in mind include encountering empty inner sequences (signaled by None), requiring us to loop till we eventually find an object to yield. It’s also important to properly return a Option<R>.None object when we reach the end of the outer source. One of the most essential parts of the code below is the storage of state outside the inner lambda, hence keeping per-enumerator state. Besides cursors into the outer and current inner sequences, we also keep the inner enumerator (recall the signature corresponding to IEnumerator<T>) in “innerE”. The interesting thing about the SelectMany implementation is that the types in the signature exactly tell you what to do: the main operation on an IEnumerable is to enumerate using foreach. The only parameter you can do that on is source, but you can’t yield those elements as the output expects elements of type R and we got elements of type T. However, the function “f” accepts a T and produces an IEnumerable<R>, so if we call that one an enumerate the results, we got what we can yield. Simple. This operator is essential to LINQ (and monads) in that it allows many other operators to be written in terms of it. Where and Select and two that pop to mind immediately, and we’ll come to those when we talk about FEnumerableEx (and FObservable) later. Again, the reader is invited to think about what I’d take to have this sequence getting generated on the background, as opposed to blocking the caller. This time we have to hook up an observer with the source and analyze what we got back. Notice the code above shows one approach to break out of or immunize an observer after a None message has been received. Notice though that if all constructor functions can be trusted (which is not the case with an Action of Func), such protections wouldn’t be required as we’re defining a closed world of constructors and combinators. If the former group never emits sequences that don’t follow the described protocol and the latter never combines existing sequences into an invalid one (i.e. preserving the protocol properties), it shouldn’t be possible to fall off a cliff. Before getting into more operators layered on top of the essential ones provided above, we should spend a few minutes looking at ways to convert back and forth between the new functionally inspired “flat” world and the familiar interface-centric “bombastic” world of LINQ. In particular, can we establish the following conversions? This is very convenient as we’ll be able to treat arrays and other enumerable collections as FEnumerable functions in a blink of the eye. 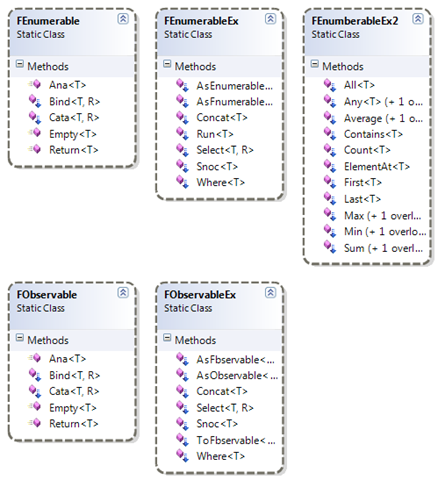 Now we can start to mix and match typical LINQ to Objects operators with our own academic playground. Here I’m using Rx’s Observable.Create operator to simplify the creation of an IObservable<T>, passing in an observer’s code body. Lambda parameter “o” is an IObserver<T>, so all we got to do is subscribe to our source (by means of just calling it, passing in a FObserver function) and forward received objects “x” to the external observer. As we don’t have a notion to run asynchronous in our little world, we simply return the no-op action delegate from the observer function. 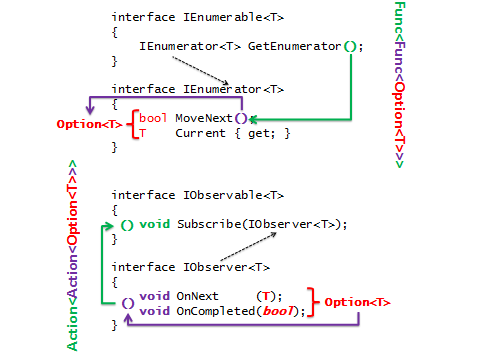 Since all execution happens synchronously upon a Subscribe call to the produced IObservable<T>, there’s little for us to do in a reaction to an unsubscribe invocation. // We got this one synchronous inside. While we leave the implementation of operators like Snoc (Cons in reverse, to construct sequences out of a single element and a sequence) and Concat (concatenating arbitrary sequences to one another) to the reader, we should focus on a few operators that can be realized using the essential building blocks provided before. In particular, we’ll implement Where and Select in terms of Bind, Empty and Return. Recall what Bind does: it combines a sequence with sequences generated from a function call, collecting the elements all sequences that result from those function calls. In a concrete sample: given a list of products and a way to get all the suppliers for each product we can return a sequence of all suppliers across all products. Or with function arrows: IE<Product> –> (Product –> IE<Supplier>) –> IE<Supplier>. This is exactly the signature of Bind or SelectMany. // Left as an exercise. The interested reader is invited to create short-circuiting operators to provide a direct path for .AsEnumerable().ToObservable().AsFObservable() and .AsObservable().ToEnumerable().AsFEnumerable(). Refer back to the diagram to see where those operators’ corresponding arrows occur. Both print 55 just fine. Boiling down LINQ to its core essence can be fun and a great eye-opener to many users of the technology. While optimizations often mandate a lower degree of layering, it’s good to have an idea of the conceptual layering of various operators to see which ones are essential and which ones are not so much. If kids can build castles out of Lego blocks, sure every self-respecting developer should be able to exploit the expressive power a few primitive building blocks to create great libraries and applications. Choosing the right set of primitives can get you a long way in such a design, as illustrated in this post. Readers who can’t get enough of essential primitives and the composition thereof are cordially invited to have a go at another Crazy Sunday post titled Unlambda .NET – With a Big Dose of C# 3.0 Lambdas (and many others in that category). In the continuation of my “More LINQ with System.Interactive” series we’ll get back to less academic stuff with System.Interactive. And before I forget: a happy 2010! I was going through your IObservable series and was keen to read this, as I'd wondered about the "essence" of LINQ myself. Unfortunately, none of the images are visible in the post currently (it looks like the links need to be fixed). Long time no see. Hope everything is fine on your side. It seems everything is working here. People have notified me of problems on my RSS feeds, which I have to look into. However, in a regular browser things look fine. Can you confirm this is the case? Problems likely come from the fact I'm hosting images on a different server, so if that's in maintenance at my hoster, things look broken. Things are fine here, hope things are going well with you. Tried to different browsers (IE8 and Firefox), both produce the same answer. Image placeholders with a little red X. Perhaps it's a timeout problem or permissions problem. On both browsers the page takes forever to come up...and I have a fairly hefty network connection. I fixed the excessive loading time, which I experienced over here too, but still can't repro the problem with the images. I'll continue some spot-checking on both domains. Thanks for getting back to this. The excessive load time must have been it, because the images load fine now.